Homestead of Isaac Blanch from about 1758 and site of his grist mill both inherited in 1767 from his father, Richard Blanch, a native of England. Isaac was a Patriot official and member of the State Assembly during the Revolutionary War. He was taken prisoner by Tory raiders early in 1777 and jailed at New York until exchanged late that year. 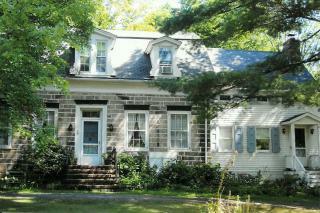 Property sold about 1788 to Davis Haring whose family owned it for the following century.